Based on the novel The Pilgrim Project by Hank Searls, Countdown is the story of two American astronauts competing with one another in a crash project to see who can become the first man to walk the moon during the space race against the Soviet Union. 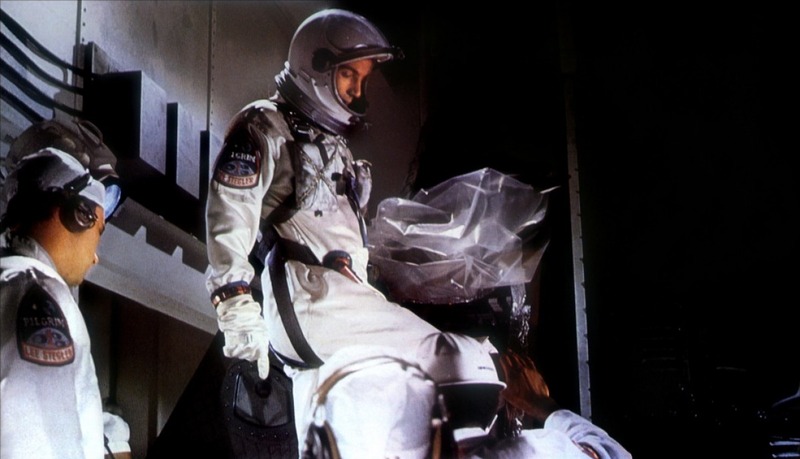 Directed by Robert Altman and screenplay by Loring Mandel, the film is an exploration into the real-life space race that was happening in the 1960s where two men do what it takes to make history. Starring James Caan, Robert Duvall, Joanna Moore, Barbara Baxley, Michael Murphy, and Ted Knight. Countdown is a by-the-numbers and dull film from Robert Altman. The film revolves around the space race to see who can become the first man to walk on the moon as a veteran astronaut is forced to train a civilian after learning that the Soviets have put a civilian for their first mission to land on the moon. It’s a film with a simple story that follows what happens during a mission training where a man is given the chance to go on the moon despite his inexperience as an astronaut but has to endure a lot of pressure. While the plot itself is unique, it’s Loring Mandel’s script that unfortunately suffers as it doesn’t really do much to be engaging in terms of the story as it is quite predictable while not doing enough to play into the tension between the civilian Lee Stegler (James Caan) and the veteran astronaut Chiz (Robert Duvall) as the former feels bad that he’s taking Chiz’s spot. Adding to the drama are the politics behind the scenes at NASA as well as what his happening at home as Lee’s wife Mickey (Joanna Moore) wonders what could go wrong leading up the mission at hand. Robert Altman’s direction is definitely very straightforward though it does bear a few elements that would be key to the style that Altman is known for. While the few stylistic moments such as a few close-ups and moments at a party where Altman would put in bits of over-lapping dialogue. Much of it has Altman just using a lot of wide and medium shots to capture some of the locations around Florida with the scenes on the moon shot at the Mojave Desert with some visual effects as it has moments that are gorgeous. The problem is that the script Altman is given doesn’t do anything to give the film any kind of looseness as it just feels by-the-book in what to do as Altman was fired during production of the film. It does feel like that a lot of the film was handled in post-production as it just goes for something that is straightforward yet doesn’t do enough to make it engaging which hurts the film and slows it down to the point that it becomes quite boring. Overall, Altman ends up making a film about astronauts trying to go into the moon into something that is dull to watch. Cinematographer William W. Spencer does excellent work with the film’s cinematography from the sunny look of the daytime exteriors to the usage of lighting and filters for some of the scenes on the moon. Editor Gene Milford does nice work with the editing as it has bits of slow-motion cuts as much of it is straightforward. Art director Jack Poplin and set decorator Ralph S. Hurst do fantastic work with the look of the crash station and simulators at NASA as well as the space capsule. The sound work of Everett A. Hughes is terrific as it play into the atmosphere at the simulators as well as the way rocket sounds from afar. The film’s music by Leonard Rosenman is good for its orchestral flourishes though there’s moment where it acts as a dramatic or a suspenseful crutch where it does become overwhelming. The film’s brilliant cast include some notable small roles and appearances from Bobby Riha as Lee and Mickey’s son Stevie, Michael Murphy as a fellow astronaut in Rick, Steve Inhat as a NASA official in Ross, Barbara Baxley as Chiz’ wife Jean, Charles Aidman as a NASA director/doctor in Gus, and Ted Knight as the NASA press secretary/official Walter Larson. Joanna Moore is excellent as Lee’s wife Mickey as a woman who is dealing with some of the problems going on at NASA as she wonders if her husband will survive as well as the idea of things going severely wrong. Robert Duvall is brilliant as Chiz as an Air Force colonel-turned-astronaut who becomes reluctant in training Lee as he is filled with jealousy but is forced to swallow his pride to help Lee knowing that he might not have a chance to walk on the moon. Finally, there’s James Caan in an amazing performance as Lee Stegler as a civilian who has some training in being an astronaut as he endures the pressure of what he has to do while knowing the dangers he is facing as it’s a very reserved performance from Caan. Despite solid performances from James Caan and Robert Duvall as well as some nice visuals, Countdown is just a terrible film from Robert Altman though it’s not really his fault. For a film about the space race of the 1960s, it’s very boring as it doesn’t really do anything new while it bear little touches of what Altman is known for as fans of his work will see this as just one of his bad films before he would become the great filmmaker that’s been lauded for so many years. Countdown is just a drab and uninteresting film from Robert Altman. I haven't seen this and I know that if you didn't like it, I certainly won't either. Nicely said, though. I would only see it if you're into the works of Robert Altman as the only reason to see it if you're a completist. Other than that, it's just eh... and Altman didn't like it very much as he got fired from the film because of his desire for overlapping dialogue. I usually like Altman's work, but this doesn't sound like his best. Still your review was very well written as always. @vinnieh-Yeah, this was a studio feature for Altman and anyone who knows Altman would be aware that he and studios don't get along and this was before he would make films like M.A.S.H. so he had very little control for this film.